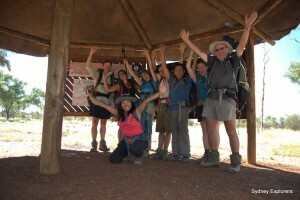 Discovery Travel Larapinta Trail by Sydney Explorers 12 days this is our story! 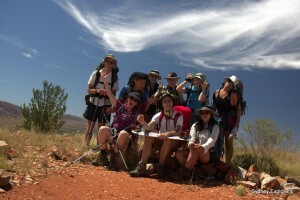 It was a warm day as we loaded our backpacks and food containers onto the minibus, the last couple of days Yen and I had been buying food for our Larapinta trek and preparing into individual servings for what will be 10 hungry hikers. 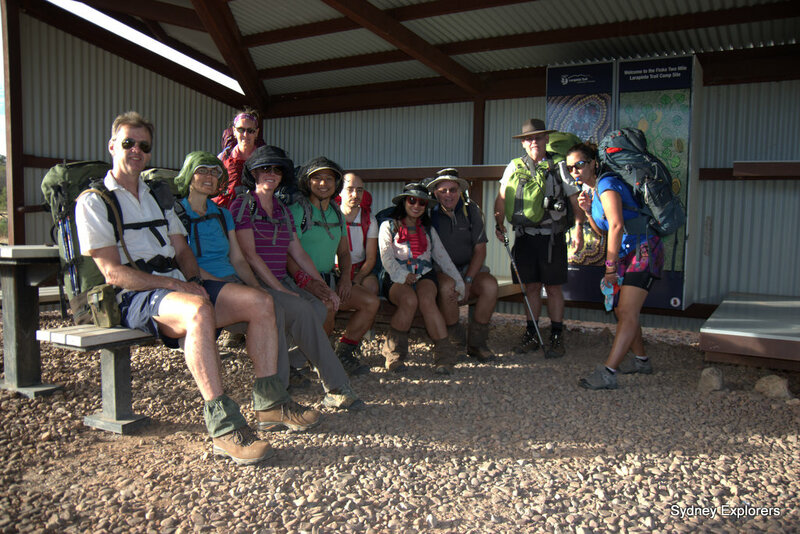 We left Alice Springs with Taylor Made Tours of Alice Springs and headed to the airport meeting 3 hikers that had flown in from Sydney that morning, we loaded their gear and was promptly heading out of Alice Springs to our first food drop Standley Chasm. 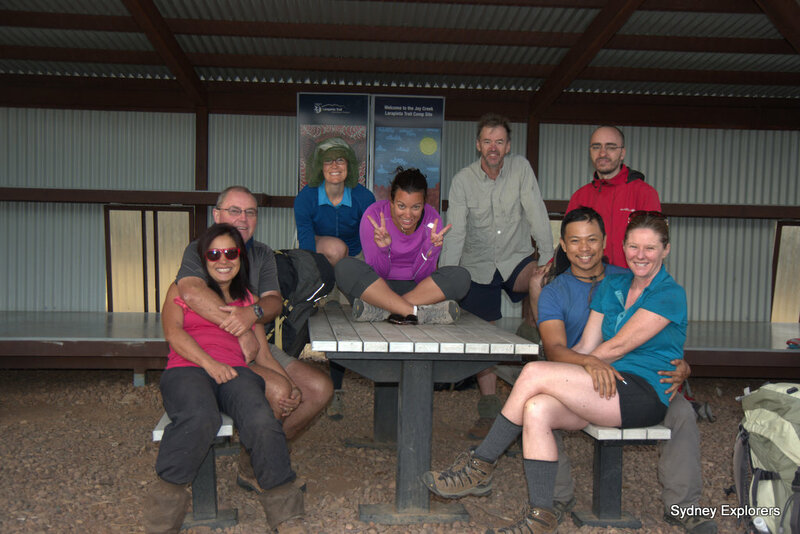 Along the way Marcia’s comment about our driver Ian reversing his minibus with trailer into a parking space “I wish I could back a trailer like that” I replied “Oh Yen can back her trailer like that” set the tone of our trip 12 days hiking the Larapinta trail all 10 of us! Ray the manager of the kiosk ships in mangoes from Northern Territory and makes mango ice cream which came highly recommended, we all bought one and loved every last creamy spoonful, food boxes was dropped into the office and off we set to Ellery Creek later to have a profound effect on our hike! The food drop was a storage area on the end of the toilet block, national parks provides key access so dropped our plastic containers locked the door and off to Ormiston Gorge for the final food drop, a room on the end of the office which also doubles as a café, great iced coffee but we had to move on quickly time was passing and that sunset calling. Our last drive along the scenic Red Centre Way and into Redbank Gorge, the start of our trek, which was actually going to be today! We said goodbye to our driver Ian and pitched tents quickly, readied ourselves for a quick walk up Mt Sonder, water and jacket only to reduce weight and of course head torches, the idea was to have sunset at the top, come down in darkness with head-torches. 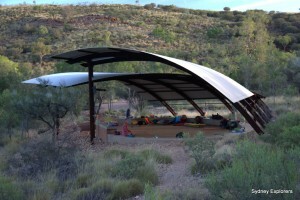 Overnight we had a good sleep, dinner was cooked up quickly and we relaxed on the banks of the Redbank Creek a dry bed meandering down to Redbank Gorge, the campsite basic no tables, long drop toilets up and away from camp and a freshwater tank. 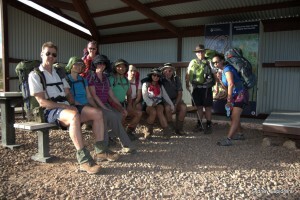 Our first trekking day with backpacks, breakfast was porridge oats a staple for the trip, pre mixed with milk and sugar yum, coffee then packing. We were ready to go by 07:30 which was good timing, not too early as it was light but not too late either, given Marcia struggled with the heat I plotted a short cut avoiding a steep climb, this we would discuss when arriving into our lunch spot Rocky Bar, thankfully with a water tank and toilets but not much else, Yen and I broke out our new Alite Mayfly chair and cooked up noodles and boiled water for coffee, a nice lunch break after a fairly uneventful mornings hike. After consulting the map and gps I recommended we take a short cut, yes I am famous for those, but this short cut would run alongside the dry river bed, we set off down a fire trail instead of up a steep hill, then turned left down the Davenport Creek which flows into the famous Finke River and our destination for the night, we walked the creek bed for about 2km before finding clear grassland on one side allowing an easy walk for the next 8km or so before we had to leave the creek and pick up the trail coming down off hilltop lookout, this seemed easy on the map/gps but in reality we found out that over the brow was another brow and both covered in spinifex to the delight of Sonya, who I am sure will have nightmares about being stabbed in the legs by this pesky grass for years to come. Thankfully I watched where I stepped and picked a fairly clear path, maybe 1.5km of zig zag skipping, hopping and trying to avoid grass that resembles acupuncture needles, not a hikers best friend for sure. Finally and to much relief to all of us we found the trail leading to Finke River camp coming down off the hill top lookout, however by this point Marcia was struggling with the heat, needing a rest, even though was easy walking now we were all fairly tired and looking forward to getting into camp, put the kettle on and have dinner, still there seemed to be a way to go, the junction for Glen Helen Resort indicated 3.5km pool, ice cream, cold beer all very enticing but its only 1.8km to Finke River camp. Yen stayed back with Marcia taking a slower pace into camp, for the rest of us one final hurdle remained Finke River itself, yes its dry but its wide and sandy, as recent rains flooded the area just a few weeks prior, several parts was unpassable unless you wanted to be knee deep in mud, we found a clear crossing out of the reeds, trudged across the sandy river bed and finally had a nice surprise, a camp shelter that could sleep 12, gas cook top and picnic table, heaven! I waited around 30 min, no sign of Marcia and Yen so took some water and headed back across the dry river bed, following my footprints and called out to Yen, a reply came back they were stuck as they could not find a way through the reeds and mud, I showed them a route, took Marcia’s backpack and led them across the river to camp. 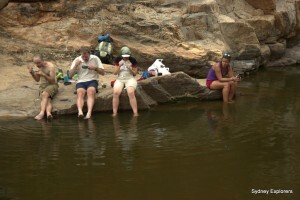 Eric, Kerry, Cathy and David went down to the drive river bed looking for a water hole to cool off in, as they took some time to return they obviously found a lovely pool of water for a swim, we cooked up a storm, Marcia just had black tea and sugar and hit the sleeping bag for a long sleep. Quote of the day: Eric watching Yen (aka Wideload) blowing up her mattress with her Exped bag which needs no huffing and puffing, said Oh Yen why are you using that gadget to blow up your mattress because you cannot blow? I chipped in with; Eric Yen is very good at blowing and needs no practice at all. An early start due to a hot day, forecast was 32c but at least it’s a short walk and dry heat, we set off after breakfast, up with sunrise and off by 7:30am the terrain was fairly flat no major hills today but Marcia was already feeling rough and had a few stops, fairly long at times for her to rest, Mitch walked with her some of the time who eventually walked with her slowly then we all took stuff from her back pack to lighten the load, the rest of us walked into camp looking forward to our food drop. We agreed if Mitch & Marcia was not into camp within 1.5 hours of us arriving I would come back with water etc and start looking, sitting in the shade enjoying a rest with just 10 min to go and readying myself to walk back in the heat, Marcia and Mitch walked into camp, very relieved to see them for sure. 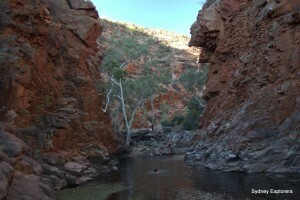 Now it was time for lunch then a swim in Ormiston Gorge waterhole, lots of leaves in he water but cool and refreshing as we all just waded in, cold but welcome, yabbies, crows and fish abound, but it was too cold to stay in for long. By this time Marcia needed shade, rest, fluids, thankfully I had medical grade hydrolyte to offer, the rest of us relaxed in the shade of the amphitheater as it was cooler than the open campsite in direct sunshine. 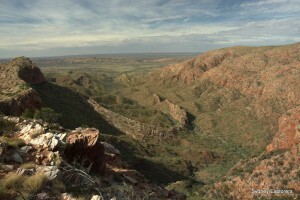 As the sun started to fade we went for a walk up to the lookout point, this is about 75m above our campsite and looks down onto the waterhole, beautiful red shades of outback rock, steep cliffs and ghost gums, Kathy and Mitch decided to do the pound walk about 6km and met us at the lookout point. Quote of the day: Yen said oh wow look at that hill isn’t it beautiful, as I was taking a photo of it, Kerry replied what hill, that one, looks just like a hill to me! After planning our days walk and talking with Marcia how she felt we decided that it was best for her to pull out, an option was provided for Marcia to join us later in the walk but given how she was feeling understand why enough was enough, the rest of us had an early start due to the distance we had to cover, 28.6km and it was going to be hot, I am not a fan of walking in the dark as too easy to roll an ankle or trip in the dark, even worse miss a turn off or the trail itself so we left as the sun started to rise. The ranger said he was not sure if water would be at Waterfall Gorge but we did something silly and gambled water would be available to lighten our load, given it was going to be mid 30’s and such a long walk it was not practical to carry large amounts of water, leaving the gorge the track was flat following the road and soon started to ascend gently, though we knew there was a climb coming and steep too, we were all to soon climbing steeply up the side of a hill suddenly as we came out above the tree line we saw a funny object discarded on the side of the trail, a Mambo skateboard, dam near new too, I took a photo and we all laughed about what idiot decided to do such a long section of walk fairly hard with a huge Mambo skateboard hanging off his backpack! 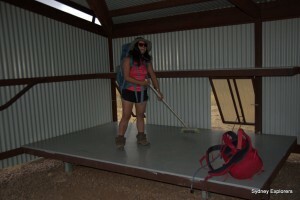 Nikita needed no encouragement to pick it up and walk off with it, a souvenir of the Larapinta Trail! The next few days Nikita walked with this huge skateboard tied to his backpack, absolutely crazy! Finally we climbed to the top of this pesky ridge line and continued along the top of the Heavitree range, gorgeous views back along the range to Mt Sonder and beyond, glorious deep blue sky and searing sun high in the sky, rough rocky trail almost non-existent, rough ankle busting rocks to pick your way through, heavy packs on our packs then suddenly a segment of refinded trail which is a relief but then all too soon gone again and walking over ankle busting rocks again, this continued for 4-5km or so, then the rough trail headed down off the side of the range steep, be careful what you wish for as we were itching to get off this hot, rough ridge, out of the heat, give our ankles and knees a break but all to soon it was a very steep rough trail down off the end of the range, into a gorge, 1 slip and we were cactus, a slip would see us tumble a long way down into a rough steep gully. Finally at the bottom we wanted a rest but not far off Waterfall Gorge, the sun hot and relentless and no breeze down here in the gorge, no shade either so pushed on, the signs points up the river bed, again rough under foot, rocks, sand, boulders and small dry waterfalls to negotiate, ghost gums blocking our path and a bit of clambering required, all whilst the sun beat down on us, my water bladder was dry, still 12km to go to camp! Finally we came to Waterfall Gorge I could see green grass and birds fluttering around and immediately thought if there are birds flying around there must be water a few of us were out of water and started to feel parched at best, thankfully sure enough a small pool of water at the base of a dry waterfall, green with algae but that was not of concern, just desperately needed water. Nobody stick their feet in the water please until everyone has filled their bladders/bottles I shouted, time to relax, try to find a slither of shade and have lunch, foil pack of salmon and rice crackers lovely light, tasty and nutritious. I really did not want to get up and walk off again, especially as I knew we had to walk out the gorge and still 12km to go, we packed our packs and clambered up and over the dry waterfall, out through a valley under a clear blue sky, in the shade temperature was nudging 35c out the shade must have been closer 45c walking with a 15kg pack, a gentle breeze gave a little respite as we trudged up through the valley, to a saddle then down the otherside, up through the valley to a saddle then down the other side you get the picture, as we got closer to a saddle we lost the breeze, at the top of the saddle beautiful cool breeze. By this stage David L was getting tired and suffering from the heat, dehydration, poor Nikita taking a small backpack now lugging his prized treasure, a Mambo skateboard tied on his back offered to swap his backpack little to his knowledge the weight difference and of course the comfort that goes with it. Nikita’s pack weighed around 10kg but David’s weighed in at more like 16kg or more, worse still it was a Kathmandu, they sold him a backpack that did not fit, a size 1 instead of a size 3 so was incredibly uncomfortable. We could see the end of the range off in the distance that we had to turn off and cut through, an old aboriginal pass Inarlanga I read a description of the terrain “with a little gentle scrambling make your way through the pass” who on earth were national parks kidding with that description, we had large boulders to negotiate with full packs, some requiring a long drop, plenty of rock hopping in fact absolutely no trail at all, just an incredible river bed, big boulders, giant cycad fronds and much more, incredibly spectacular but after such a hard, hot section, not what we wanted to have to walk through, one boulder I jumped down to a lower ledge, lost my balance camera in one hand and slammed into a boulder, my shin finding the only piece of rock sticking out below as an overhang and the profanity could be heard for miles, ouch! Finally we came to a track leading out to the left and a sign post, the light was starting to fade, Yen kept asking for a break, rather annoyingly several times, and I snapped back, shin throbbing, that we must keep going as its getting dark, not good to do the last section in pitch dark, unfortunately my reasoning came good and soon we were walking through tree covered tracks with little or no signs, darkness was descending, head torches on, the trail led to a dry creek bed but where does it exit, its dark in here as the creek is covered by trees? Up the creek I searched, no paddle required and found an exit, same side as it entered which was strange, then another creek and searching for another exit, again and again this continued, finally up the side of a hill and down to an open dry river, a sign post! At last into camp at Serpentine Chalet Dam, it was cooling off thankfully, but no shelter, only two small water tanks and a toilet, Nikita trudged into camp weary, the look on his face said it all, but with many thanks and praises from David L, Yen and I were too tired to pitch tent, just laid out our sleep mats under the stars, sleeping bags rolled out and slumped in our Alite Mayfly chair, boots off and changed shirts into a clean dry one, dinner on the stove, a quick chat to everyone to make sure everyone was OK and bed, phew, one of the hardest days of an overnight walk I have done. Quote of the day: Standing at a point called Base of Hill, Mitch asked hey anyone know why it’s called Base of Hill? Look up Mitch, look up we replied in tandem. Although graded hard similar to yesterday’s walk it was much shorter and we decided on a lye in, lazy morning breakfast to recover a little from yesterday’s mega hike, we were up at 7am just after sunrise but were happy not to have to rush and relax a little, stretch those muscles and joints, stiff as a board before starting off. Eric was boasting how much room he had in the trousers he was wearing, we asked why? could he not fill them? Eric said they were Kerry’s and we all laughed at Eric wearing girls pants he could not fill! It was April fool’s day and all of us totally forgot, the trail had the last laugh, yes it was graded hard but hey its only 13.4km. Soon we were clambering up a steep hill side, up, up and up some more, finally we came to a junction a small tree on the top of the ridge offered a small bit of shade we all crammed under, Counts Point was a lookout, another 10 min walk along the ridge, the trail rough, rocky ankle busting track of some sorts, we had a rest for 5 min and without backpacks a few of us made the walk to the lookout point only to find this was over the ridge and further on, we had walked half way only to find we had further to go, off we trudged skipping over rocks and picking our way to the lookout point in the blazing sun, amazing views down the range, deep blue sky, searing sun, rough red ridge running all the way to Mt Sonder way off in the distance, a lovely breeze blew and this kept us hanging around for quite sometime enjoying both the breeze and the view. Lunch beckons and back to the tree at the junction, we cooked up some noodles and a hot black sweet tea before donning our packs again, frustratingly there were more ankle busting rocks, rough track to negotiate along the top of this ridge but there was a little more sporadic path interspersed but difficult to keep to and follow, finally we came down off the ridge, a series of switch back tracks, Nikita carrying his own pack with skateboard firmly strapped to his backpack. 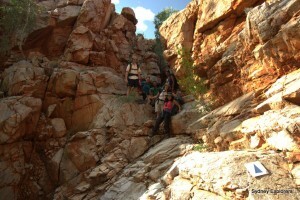 The trail wound around gentle rolling hills, over low saddles and was much easier on this section, soon we wandered into camp a steep sided gorge, green grass, lovely waterhole and gorgeous deep red rocks. As we arrived around 3.30pm fairly tired it was a short walk to the waterhole, off with the shorts and in for a swim, I packed my swimmers but never used them once, all too hard to change. 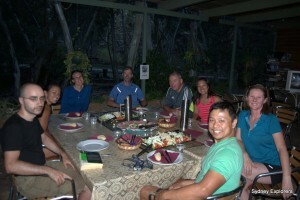 Around dinner we planned the next day 13.8km hard, lets have an early start so we get into Ellery creek in time to enjoy a swim and lunch at the café, yes I said we can all have an ice cream and cold drink on arrival! Dave’s famous last words. Quote of the day: Sonya woke with the sunrise and said “My hair feels like a dogs arse” “What” How would you know what a dogs arse feels like? Don’t you ever massage a dog’s arse says Sonia? No we don’t, oh you should try it, they love it, it’s the best thing for dogs massaging their arse! Really no thank you! Today’s walk was graded medium however was 31km in length and no water anywhere along the trail so for our 11-12 hour walk in hot sunny conditions we would have to carry enough water each to last the whole day. 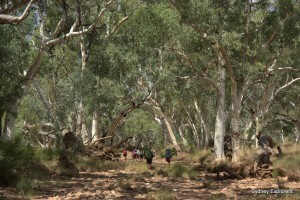 Weather forecast was sunny and 35c, that would be 45c in the sun, after much discussion and although we really wanted to do every section decided to skip and thumb a lift, yes after breakfast as campers started to pack up and visitors came into Ellery creek for a look see, we went into hitch hiking mode, excuse me are you heading back towards Standley Chasm? Slowly but sure we all found lifts at varying times in the day, Sonya had been chatting to two guys travelling around Australia, hunks she called them, off for swim, oh want to try hot chocolate? Yes smitten by these two friendly hunks she was not overly keen to transfer to Standly Chasm, the water is so nice here I would love to stay another night! Arriving into Standley Chasm by 4pm Yen, Sonya and I was the lucky last, a bushwalker Jill had been out for a day hike and had offered us a lift after her walk. Ray is the manager of Standley Chasm an Irishman, he imports Mangoes from the Northern Territory and makes his own Mango Ice Cream, first on the list followed closely by a cold Coke zero, that Mango ice cream was fantastic, they had showers which were not heated but out there in the heat nothing is really cold, we took a refreshing shower then after talking to Ray he offered us a buffet, &15 per head, some food was left over from a coach tour and we struck a bargain, Ray a former chef laid on a fantastic cold buffet, plenty of cold meat, potato salad, pasta & tuna, salad platter, bread and fruit sundae with ice cream to finish. 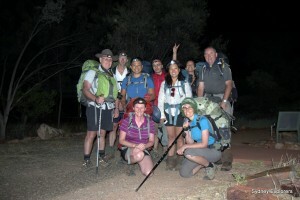 As we were camping at Standley Chasm I suggested we do a full moon walk into the chasm itself, had to don our head torches and 9pm walked up the trail to Standley Chasm itself, not as spectacular as day time but we should have waited until the moon was high in the sky, anyway it was an experience. 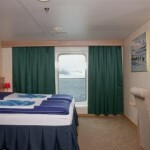 Quote of the day: Mitch looked across the veranda and said hey how come Dave is on the TV, we all laughed as we told Mitch it’s not a TV but a mirror! 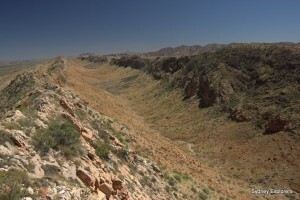 We started early to beat the heat, walking at 8am up through the chasm, we had an extra day up our sleeve as we skipped three sections from Ellery Creek and now were walking back onto this last section into Standley Chasm. Beautiful sand stone colours and plenty of photographic opportunities, a group photo at the end on the rocks, in the old days you could walk all the way through but a rock slide has blocked our way so in and out the same way. Nikita decided to read a book, big bugger too but he seemed engrossed in it and took the day off walking, after the chasm we flew up the steps, a steep climb out of the chasm and up further, up and up some more finally to a spectacular lookout Bridle Path lookout, I reckon the best lookout on the whole trail a little further up the trail and off to the left a shear drop off the edge of the ridge but gorgeous views. After lunch a siesta, except Nikita who was still reading his big book, it was getting hot so nice to relax in the shade, watch the tourists come and go, plenty of mosquitoes though and the gossip was of the lunar eclipse tonight, we were in the perfect position to view it, clear outback skies and nothing much else to do, supposedly at its best just after 9pm so we gathered with anticipation in the car park to watch the clouds whip across the sky, yes as we gather with excitement the clouds cover the moon, we could see glimpses of the eclipse but nothing as spectacular as we hoped for. Thankfully the weather forecast for our next few days was getting back to normal, 32c and the following two days 25c perfect! 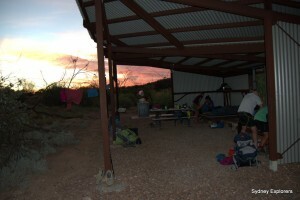 Breakfast was Spanish baked beans and eggs, plenty of eggs left as no Marcia or David lovely tasty big breakfast, our leftovers went to our lady camper who nearly lost her phone, she was very happy for our offerings once again. We left just after 7:30am off to Jay Creek, the rating is hard with the first few kilometers uphill, steep at times up through the chasm and up over the top then down steep climbs then up more, at the top of the ridge lovely views but then down into the valley and into a creek bed, hard walking over a sandy creek bed full of rocks, boulders hard on the feet and ankles, seemed slow and much longer than actually walked but finally arrived at Fish Hole, nice cloud cover which we missed the last few days & kept the temperature down, at lunch time cooked up our noodles by the waterhole and had a swim, nice to laze around but 4pm just as we were leaving two 4wd vehicles drove in, two large families coming for a swim and camp the night, perfect timing as we had the place to ourselves until then. Back up over the ridge again although the distance was around 1.8km to camp it again seemed to take ages, up then back down again into the creek bed hard walking, slow with our packs but finally into the cute little campsite, a brush to sweep the bed platform and picnic tables was a perfect camp. Mitch was the Easter bunny and offered mini chocolate eggs to everyone, nice finish to a great day. 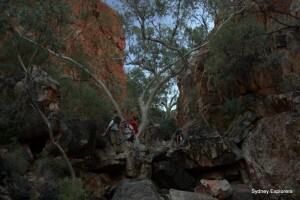 Just as we finished dinner two walkers came in, tall with walking poles a huge backpack, gaiters and strong complaining of a tough hard walk from Simpsons Gap, 24km, yes we know the grade was medium though, but they said the creek bed walking was impossible and they had been walking 15 hours! I offered to make them a mug of tea each which they were appreciative of as they pitched camp, I didn’t want to say much but they have packed way too much, after pitching their tent they decided to move it as the wind picked up, they enjoyed their tea had a cold dinner and hit the sack exhausted. Sonia was not impressed and refused to honour our bet, no massage as I’m too tired! No wonder the English are losing the cricket… Sonia was off with her boots and out with her golf ball to massage HER feet. 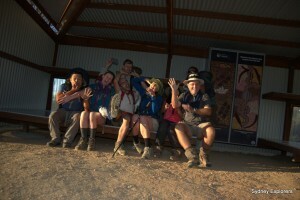 We all arrived tired and ready for a lazy evening, after all tomorrow we were walking into Alice Springs for a cold beer! 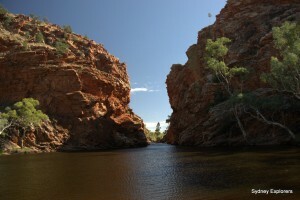 It was after 2:45 and a late lunch we’re looking forward to a dip at Simpsons Gap, it was cold in the shade and windy but a beautiful gorge, sandstone eroded over millennia shades of red, orange and brown weathered by rain and wind but a perfect spot for us to dip our feet in the water, there were signs up asking no swimming so we obliged, this protects the wildlife from our sweat, sunscreen, deodorant and the likes, so back to camp for a siesta. 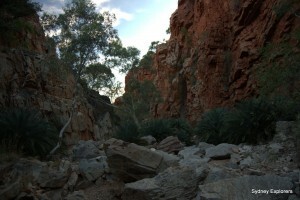 Around Simpsons Gap supposedly cute little rock wallabies, after dinner we decided to head back to the gap wildlife watching, a few tourists were there but not a movement anywhere to be seen, tiring quickly of gazing into the rocks and scrub high up above we walked back to camp, brewed up a hot cuppa and gave my last briefing on what to expect from our walk tomorrow, our last of the trek! 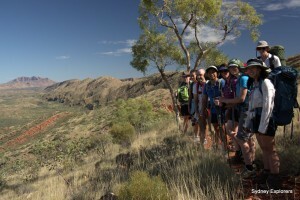 Our last day was uneventful but again seemed much longer than we expected, we started with a climb out of Simpsons Gap, then over grass hills meandering in and out of gullies, finally coming to the Euro Ridge a steep climb but not that big but seemed to go on and on, a ridge of sandstone pushed up on its edge from below creating a steep drop off on one side and a sloping drop the other, up some steps then onto the ridge which climbed slowly up and up as we followed the ridge a steep drop on one side and a slope the other, the odd kangaroo looked on in amusement, pretty much the only wildlife we saw on the whole trek! The views from the ridge were spectacular, a lovely deep blue sky, yellowy grass and the dark reds and browns of the sandstone, way off in the distance we could see little Mt Sonder our first peak we climbed on day 1. 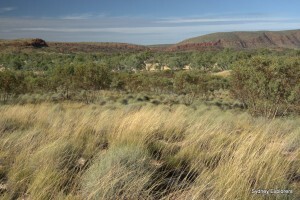 Alice Springs appeared in the distance, as we climbed off the ridge and down onto a walking trail finally finding flat ground we followed a dry river, then crossed a railway track and under a hiway, we were all a little sad but happy, sad as our adventure was coming to an end, happy we would be in Alice Springs for a cold beer, hot shower and comfy bed in a few hours’ time. Our last section to Telegraph Hill was annoyingly frustrating, for some weird reason they have created a mountain bike track on the final section of the Larapinta Trail, the track has humps (for the delight of mountain bikers) built into the trail, zig zagging track is not really suited for hikers with big backpacks and several times we had to stop, stand aside and give way. 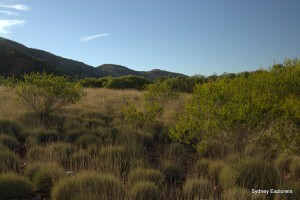 Barren bushland too as a fire had been through earlier so boring walk, but finally arrive at Telegraph Hill named as the point the first telegraph was sent across the country. Milkshakes all round at the cafe, and the surprised staff that we had done the walk in the direction we had and heat we endured congratulated us all, we sat celebrating among ourselves with cold milkshakes and relaxed in the sunshine, writing postcards to send off from a special UK style post box, post marked from Telegraph Hill. 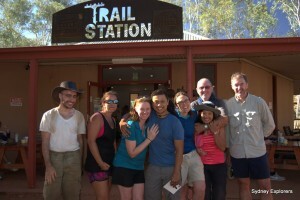 David L had stayed in Alice Springs whilst we completed our walk and came to meet us, his knee sore but walkable, our last couple of kilometers alongside the dry Todd River into Alice, a paved walkway we walked together, Sonia booked a taxi! We arrived into Alice Springs walking down Todd Street and into Todd Mall one eye on Sporties, a bar nearly in the middle of the mall, there it was, finally on the right, they had a fenced off seating area out front, dropped our backpacks on the floor, walked inside and ordered a schooner of beer! Sitting outside watching people go about their everyday lives up and down the mall shopping for souvenirs and paying bills, we high five each other, took some group photos and reveled in our new found comradery and the satisfaction of completing the Larapinta Trail! 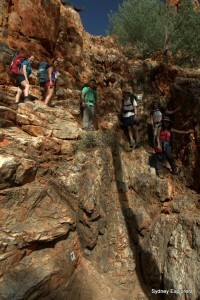 Important information: When to walk the Larapinta Trail, you can actually walk it all year round however some of the creeks/rivers may be impassable during rainy season typically Dec to Feb however it is also hot during these months often 40c. 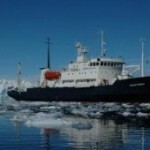 Best time according to some is May to Aug but be prepared for freezing temperatures at night and early mornings. We walked the last week in March supposedly average temperatures around 28c but we had 35c, the last section of the walk down to 22c and cold mornings. 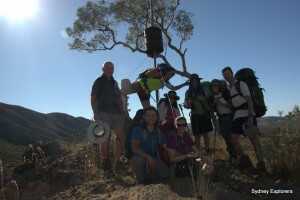 We also walked from Mt Sonder to Alice Springs, traditionally its the other way however, we noted a couple of sections that were easier in our direction, also arriving into Redbank Gorge can be done direct from a flight into Alice Springs with time to pitch camp then hike up to Mt Sonder for sunset. 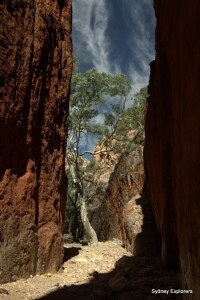 Also the novelty of walking into Alice Springs is worth it rather than driving!